As steward of 2.6 million acres of state-owned land beneath Washington’s lakes, rivers, marine waters and estuaries, DNR has a unique role to play in the effort to ensure healthy waterways. The Aquatic Restoration Program works to restore ecological quality and function to native aquatic habitats for their ecological values, for the benefit of the people, plants, and animals that live there. 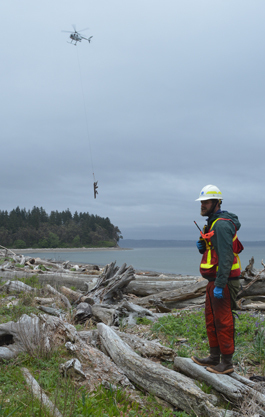 DNR’s Aquatics division achieves this by restoring, enhancing, creating and protecting healthy ecological conditions in freshwater, saltwater, and estuarine systems through partnerships with agencies and organizations across Washington. DNR’s Aquatic Restoration Program has carried out restoration projects across the state, removing toxic debris, re-vegetating riparian zones and restoring natural functions to estuaries and nearshore environments that are crucial for many wildlife species. Capitalizing on partnership opportunities allows DNR to move forward with successful projects in the three focus areas below.